U.S. Olympic skier Gus Kenworthy rescued a husky puppy from one of South Korea's 17,000 dog farms. 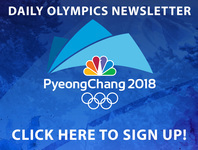 The two-time Olympian performed a similar act in Sochi after he stayed a few days after the games to complete the necessary paperwork needed to adopt four stray puppies. But this time around, Kenworthy faced a much more harrowing experience. In his Instagram post, he called the way the animals were being treated at this farm, "completely inhumane." He also said that he understands "eating dogs is part of Korean culture" and that it's "not his place to impose western ideals," but that "culture should not be a scapegoat for cruelty." The farm Kenworthy went to was described as "kept in good conditions" compared to other farms, but Kenworthy said the dogs were, "malnourished and physically abused, crammed into tiny wire-floored pens, and exposed to the freezing winter elements and scorching summer conditions. When it comes time to put one down it is done so in front of the other dogs by means of electrocution sometimes taking up to 20 agonizing minutes." But Kenworthy didn't just save one puppy, he saved all 90 dogs kept at the particular farm he visited. "Luckily, this particular farm (thanks to the hard work of the Humane Society International and the cooperation of a farmer who's seen the error of his ways) is being permanently shut down," Kenworthy wrote. "All 90 of the dogs here will be brought to the US and Canada where they'll find their fur-ever homes." However, Kenworthy said this one farm is just the tip of the iceberg. "I'm hoping to use this visit as an opportunity to raise awareness to the inhumanity of the dog meat trade here in Korea and the plight of dogs everywhere, including back home in the US where millions of dogs are in need of loving homes!" he said.